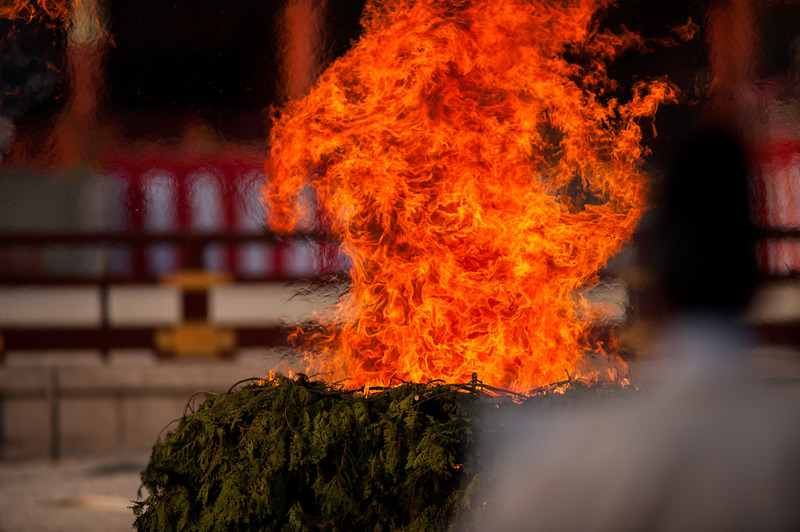 The picture above is from the bonfire event, described in my “Intense Burn: Shinto Rite at the Heian Shrine” post. 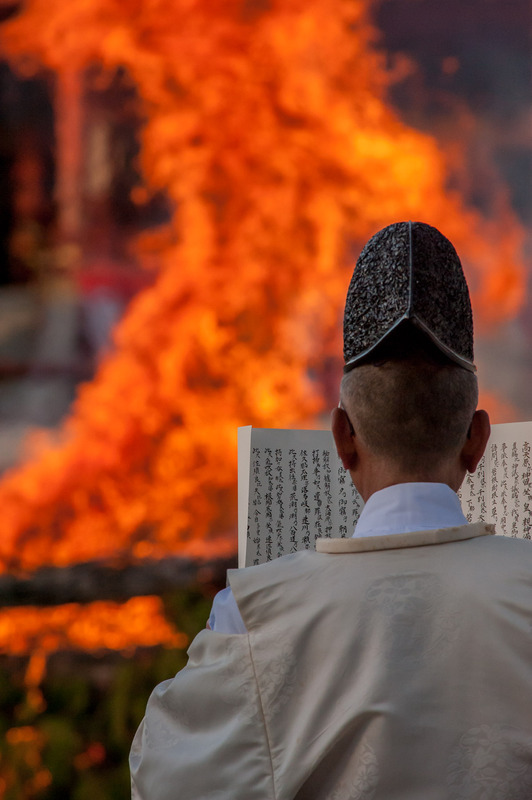 A line of priests was chanting as others threw bundles of sticks with wishes written on them (the wishes then going up with the smoke to the heavens, or something like that). I processed these photos with Lightroom 4 and its new render engine, and I notice that the flames retain much more of their true orange color. This is wonderful, as it always bothered me how bright, intense colors got washed out toward white, leaving the flames in the intense-burn post more yellow than orange. I'll have to try processing them in Lr3 as well, to confirm the better result is not all due to a different camera or better exposure. 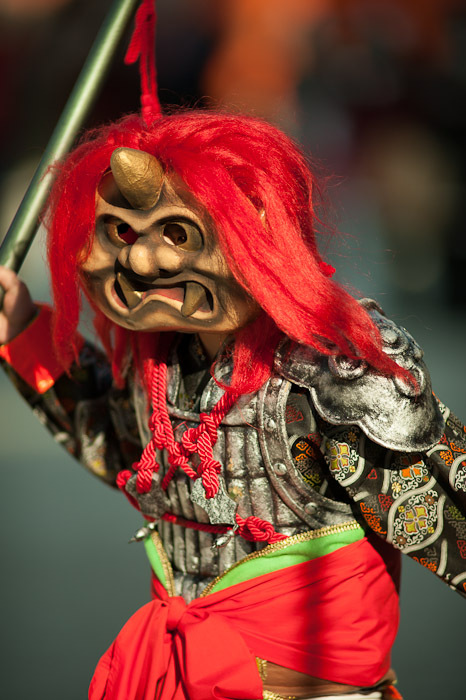 ... and then bringing in good fortune by more bean throwing, but this time as packets one could catch and bring home (as described in my “Setsubun Mamemaki: Throwing of the Beans” post). The hyper-made-up world of the geiko (Kyoto's geisha) is not really my thing, but I loved the smile on the one in the photo above.... she looked like she was having a total blast, and that made it all the more fun. I found myself wanting a pack of beans to bring home for Anthony (and maybe bring home some good fortune for myself), but gave up on the idea because I didn't want to wade too deeply into the crowd with my big lens. But I was surprised not once, but three times as folks going by gave me a pack. How wonderful. We had them this evening after dinner. Geisha is the general term used more often by foreigners than by Japanese, although it is also used by Japanese. 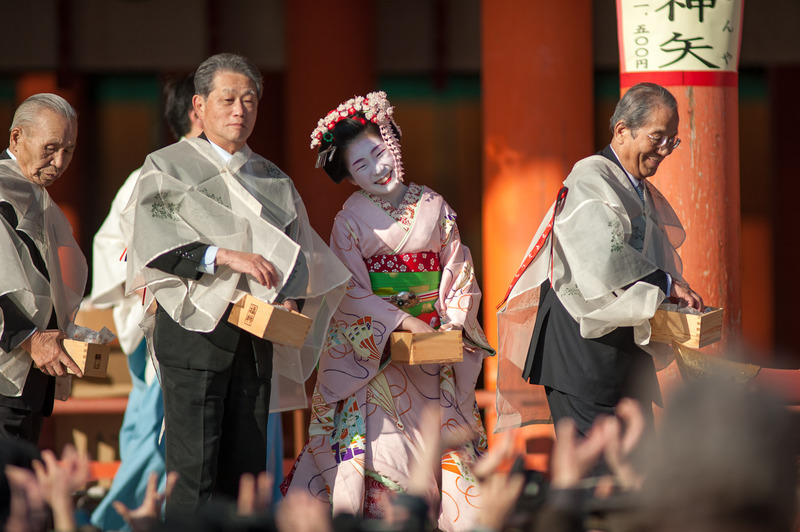 When it comes to the one you have in the photo, it is actually not a “geiko” but a “maiko”. Both are what we call geisha. The distinction is that a geisha is a maiko until she reaches the official adult age (20 years old, as you have often pointed out); once she turns 20, she becomes a geiko. I hope this info is interesting to your readers! Wow! That first photo is fantastic. I like it.